I think we can all agree that Grandma's make the best treats! So, why would that be any different when it comes to dog treats? I am fortunate enough to be a Chewy Influencer and in exchange for my honest reviews, my three spoiled furry children get special food and treats, delivered right to our door, every month! Zena ( 2 year-old English Mastiff), Thor (2 year-old Great Dane/Bull Mastiff), and Hercules (5 month-old Neapolitan/English Mastiff) are some really lucky dogs! When they see the blue Chewy.com box being delivered, it's almost like they know it's for them! 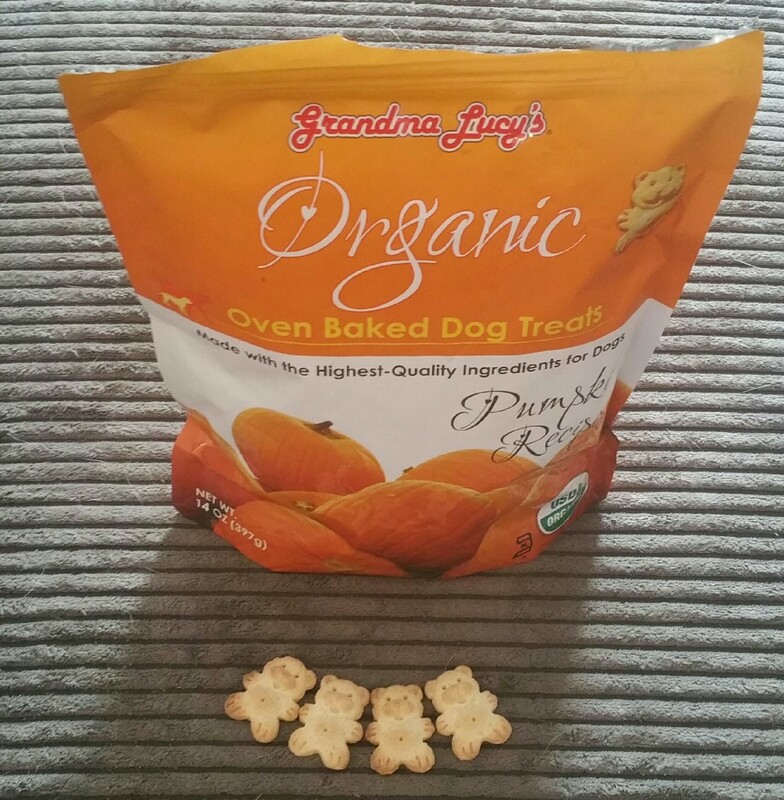 Zena, Thor, and Hercules were super excited to try Grandma Lucy's Organic Pumpkin Oven Baked Dog Treats this month! When Hercules heard me opening the package, he couldn't sit still... his tail was wagging like crazy! As a result, getting a picture was nearly impossible and didn't go as planned! Grandma Lucy’s organic dog treats are not made in a factory but baked in a bakery by people who love their pets. Since 1999, Grandma Lucy’s has taken great pride in making wholesome, natural and delicious pet treats. Your dog will love the great taste of these Organic Oven Baked Dog Treats, but what you will love most is the fact that they are made with organic, human-quality ingredients for dogs. The treats are so tasty, your dog will beg for more. 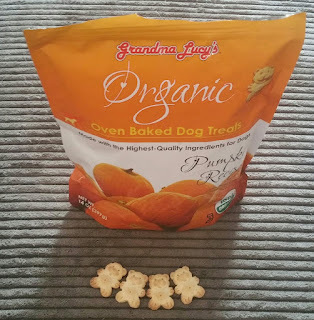 Grandma Lucy’s Organic Oven Baked Dog Treats – an organic treat you will feel good about giving your pet. My daughter said that these cute little oven baked dog treats reminded her of Teddy Grahams! All three of our dogs loved these treats! They have a great texture and were easy even for the puppy to eat. Some dog treats are too hard, but these ones were perfect! Grandma Lucy's Organic Pumpkin Oven Baked Dog Treats are the perfect treat for dogs of all sizes. I will even admit that when I opened the package, they smelled good and made me think about eating one! Are you a pet owner that likes to save time and money? Did you know that Chewy.com offers over 1,000 brands of pet food, treats and supplies and offer FREE shipping? Chewy allows you to shop over 500 pet brands and have them delivered right to your door with FREE 1-2 day shipping and 24/7 customer service! In addition to their vast inventory, Chewy.com has the goal to create the largest shelter and rescue program designed to support non-profit organizations that help animals in need. Trust me when I say that Chewy.com is the best! Great prices, fast delivery, and auto ship is a wonderful feature too! Getting the top-quality products your pets love has never been more easy, affordable or convenient! I received this item free of charge from Chewy.com in exchange for my honest review. Those DO look like Teddy Grahams. I bet pups love these! 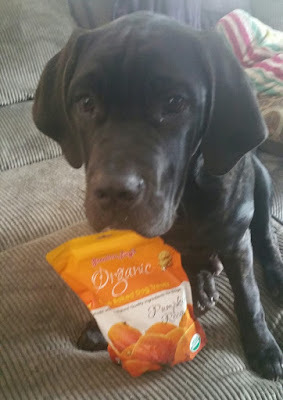 Organic pumpkin sounds great for the discerning doggy! Earn BIG At The Register!